The resurrected BMW 8 Series family will give us three models over the course of the next decade. 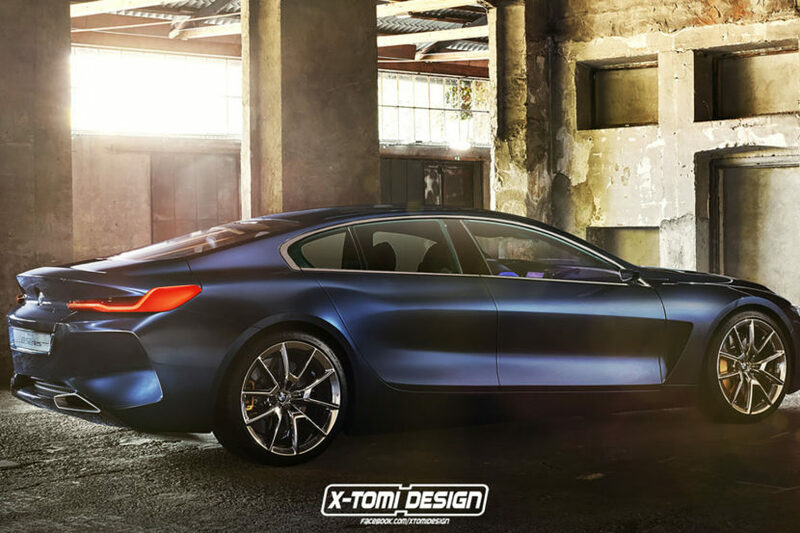 The first one – 8 Series Coupe – was already unveiled in Concept form, and will be followed next summer by the production model – codename G15 – and late in the year by the G14 8 Series Convertible. The third and final model will be the Gran Coupe variant – codename G16 – which is scheduled to arrive in third quarter of 2019. Test mules are yet to be seen on public roads, but early renderings showcase the four-door coupe 8 Series as a sleek tourer with a long bonnet and short overhangs which will take on the likes of Aston Martin Rapide. The exterior design of the Concept 8 series is credited to John Buckingham, a Brit now working out of BMW’s DesignWorks studio in California, a design which will serve as the basis for the Gran Coupe. BMW has modified its latest rear-wheel drive platform – CLAR (cluster architecture) – in creating the new 8 Series, which receives its own unique wheelbase and track widths to provide it with a suitably low and hunkered down stance reminiscent of the first generation model launched back in 1989. The 8 Series also inherits the lightweight construction processes found on the existing 7 Series, including the use of plastic reinforced carbon fiber within load bearing structural elements. Standard on all the 8 Series models will be double wishbone (front) and multi-link (rear) suspension with constantly variable air springs all round as well as an integral rear steer function aimed at providing it with class leading dynamics. Alongside standard rear-wheel drive versions of the new 8 Series, BMW also plans a limited number of four-wheel drive xDrive models. The likely entry level model is the 840i running a turbocharged 3.0-liter in-line six cylinder, followed by a 850i with a turbocharged 4.4-liter V8 and M860i xDrive M Performance fitted with the same turbocharged 6.6-liter V12 that powers the M760Li xDrive. Also under consideration is an 840e plug in hybrid model using the same petrol-electric powertrain seen in the 740e iPerformance. All those engine options are likely to be used across the entire 8 Series range. While the 8 Series Gran Coupe is still ways out, the coupe model is slotted for production in Summer of 2018.